In 2014, Ilaria Lupo invited sound artist Joe Namy to create a site-specific soundtrack for a construction pit in Beirut – composing a collaborative piece with the laborers using their tools as instruments to perform live. The performance was titled “Concrete Sampling, arrangement for derbekah and jackhammer”. Now in its second edition – in collaboration with sound artist Rabih Beaini – the project has a wider perspective on the region and is especially conceived for The Bahrain National Quarry. 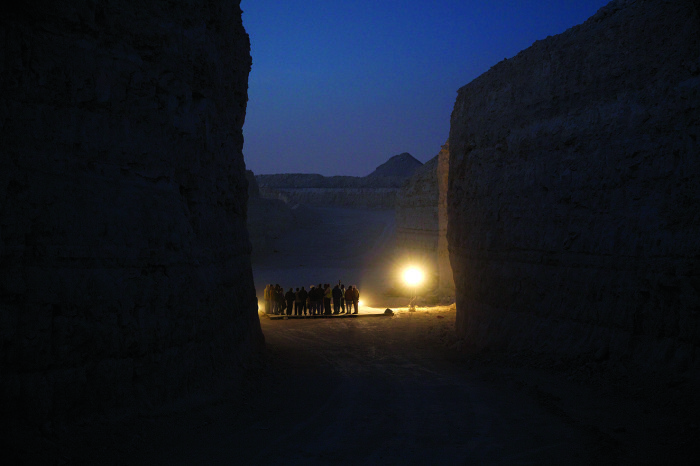 “Nocturne for Pit Orchestra” digs into dynamics of music-making in the frame of labor while aiming to explore the intermingled layers connecting the quarry’s identity with the socio-economic shifts in 20th century Bahrain and the Gulf Region. Beaini engaged with the site laborers after contextual research, in particular on the pearl divers music – Fidjeri. Historically, Bahrain is influenced from the Persian, East African, South Asian and Levantine cultural basins. The Fidjeri is a vocal music of great complexity, embodying a pivotal history of labor in the region. He involved the group in a process where an array of influences were explored and combined. The workers are from North India and despite no professional experience, they are very familiar with vocal practices. With Beaini, they rehearsed vocal droning, looping, amplifications, polyphonies, solo and choir. The final performance unfolds as a process navigating between dissonance and harmony. The composition is on and on dismembered and recomposed while the structure contains both conducting and improvisation. The stone quarry – located in the desert of Hafeera – represents the very hearth of sources extraction destined to construction. This landmark site has witnessed the transition between two economic eras and the consequent changes in the system of labor. It came at a time of acceleration, accompanying the radical reconfiguration of the urban landscape and the shoreline. It is a site of Modernity while the project attempts to question this ‘modern’ identity and its ties with the past, still reverberating today. The project is kindly supported by The Bahrain Authority for Culture and Antiquities, Red Bull Music Academy, NASS, Al Riwaq Art Space, Temporary Art Platform, FARE. With the Festival The Spring of Culture.The performance will be presented in the quarry itself, opened to the public for the very first time. 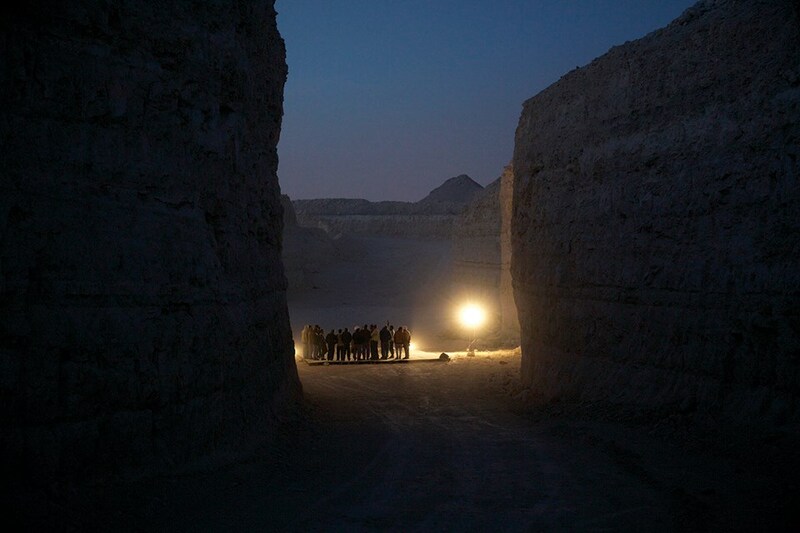 The performance will be presented in the quarry itself, opened to the public for the very first time.